Doctors say if the baby hasn’t arrived at the end of the week, it probably won’t. Three days have passed since Prime Minister Jacinda Ardern was due to give birth to the greatest baby known to have ever been born in these parts, and as the hours drag on with no news, fears are beginning to emerge that it may never be born. “No taxes or mean bosses, either,” she added. “The baby knows when it’s due,” he said. “It can tell because of a tiny clock in the hypothalamus. 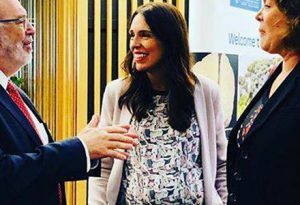 Beattie said it would be “entirely possible” for Ardern to live with the baby “as is,” but that it would be “very uncomfortable” and become “increasingly difficult” as the baby grew older. Sources close to Deputy Prime Minister Winston Peters say he has grown increasingly nervous about this prospect. Peters has long looked forward to his several-week stint as Acting Prime Minister, the end of a long dry spell lasting two decades. But if the baby never comes, he may be left out in the cold. A press conference will be held at the Prime Minister’s podium once every two hours on weekdays. The first of each day will address major issues facing the country, while the subsequent seven press conferences will address arguments about the previous one. An early version of the statement – now retracted – appeared to be addressed solely to former Newshub political editor Lloyd Burr, who isn’t even in the country anymore. He has reportedly sent a spring snake joke toy to the Prime Minister, in hopes of scaring the baby out. One person not bothered by the length of time it’s taking Ardern’s baby to arrive is opposition leader Simon Bridges, who is pleased to have extra time to figure out what adorable thing he’s going to do on the television to divert attention.